5 Pounds - FREE SHIPPING!!! - Medium Flat Rate box will hold 6 Pounds. - Large Flat Rate Box will hold 8 Pounds. NOTICE: At this time we only ship to the United States and Canada. Please contact us about other international locations. If you wish to return a product you have received from us, mail the item back to us at M & M Kona Coffee, LLC, 78-6693 Mamalahoa Hwy., Holualoa Hawaii, 96725 with your name, address, order number and reason for return. We will issue a refund. 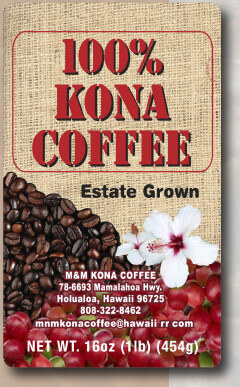 M & M Kona Coffee, LLC will only refund the product’s cost and not the cost of shipping returns to us.